We have raised the bar once again with another JEGS original, a billet aluminum master disconnect switch faceplate! Do you need it? Probably not. Do you want it? You bet! Made from 6061 aluminum plate with tastefully machined through "On"/"Off" locations. So, if mounted to a body panel the contrasting color will appear. Available in clear & black anodized or polished finish. Another JEGS original, just when you thought it couldn't get any better, we did it again! 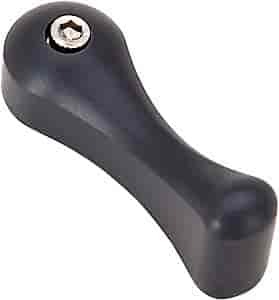 A billet handle for your master disconnect switch. Now there is a professional accessory to set off that all important safety item. We changed a block of 6061 aluminum into an eye appealing shape and added a stainless steel screw and washer. Available in polished, satin clear or black anodized finishes. Will fit JEGS 555-10305, Moroso 710-74100, and most other switches. JEGS Billet Aluminum Battery Switch Handles & Faceplate Kits make it easy to match up a 125 AMP Disconnect Switch with a slick looking Billet Handle and Faceplate. 10341 is rated 5.0 out of 5 by 1. Rated 5 out of 5 by Boo Boo Sgas from Quality product. Nice quality piece. Strong and durable. Finish is great.